Donald Trump has now embarked on his first foreign trip as President of the United States. He has made the choice to go to Saudi Arabia, he will discuss relations between the two nations. It is also said that he will talk about the two nations combating terrorism. Mr. Trump received a more than warm welcome into the country when he got off his plane. The President is also the first leader of the United States to make a Muslim majority country their first visit. 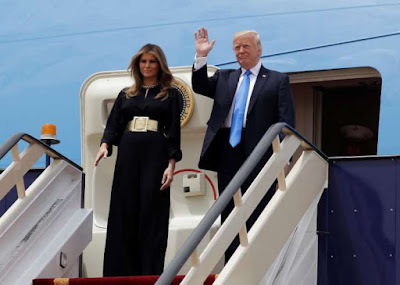 Donald Trump and his wife Melania Trump were in the doorway of Air Force One when they saw their large welcome that included a military flyover. The military flyover was done by jets and left red, white, and blue stripes in the air. While Trump said “It was a great honor” to be there and meet the king of Saudi Arabia who had to use a cane for support. The king and Trump exchanged a short conversation. The entire meet up has happened in Riyadh. The President was even given the highest civilian honor in Saudi Arabia. The award is called The Collar Of Abdulaziz Al Saud. He was given the awesome award for being recognized of trying to improve relations in the region. It must be noted that Russian President Vladimir Putin also got the award. It’s a great thing that Trump is trying to greatly improve relations because there has been a lot of tension within the past few years in the region. It is also said that both the King and Trump were talking about arms, natural resources and the overall destruction caused by the Syrian Civil War. The White House, of course, does hope for this to not only strengthen ties in the region but to also go forward and maybe distract people from the recent media backlash of Trump firing James Comey who was a former FBI director. When compared to Obama, Trump seems to have a better chance with Saudi Arabia because it has been noted that the Saudi leading family was beginning to get frustrated with Obama’s approach to Iran. On Sunday The President will hold a meeting with at least 50 Arab Muslims leaders to discuss and try to combat radicalism in the Muslim world. This should be great PR for The President as he has had a large amount of bad press recently. Trump will have a great deal of work to do in the region since his administration differs greatly from his predecessor's administration. Trump’s wife Melania Trump, also did not wear a veil of any sort and there does not seem to be any issue with it so far. It will certainly be interesting.